Hello readers, and fellow mechanical pencil people. Five years old. 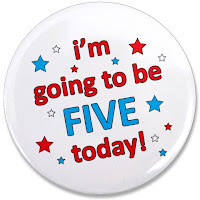 I’m somewhat surprised I’ve made it to my fifth birthday. Well anyway, various people have pointed out to me that very few regular ‘weekly plus’ blogs make it to five years, so this is a significant anniversary and a little contemplation and celebration seem in order. Around about six years ago I somehow tripped across Pencil Revolution, was hooked, and flushed with revolutionary zeal, I started this blog on 30 January 2006. I once read somewhere that the secret to long term blogging is to “Blog what you love” and I guess that’s worked for me as I have enjoyed publishing this blog. On the technical side, learning the ins and outs of publishing a blog, improving my photography skills, learning a little HTML and so on has kept my interest up. On the pencil side I’ve certainly dramatically increased the size of my collection, which today stands at about 700 mechanical pencils, plus heaps of other things like leads, catalogues and ephemera. It’s fair to say this blog has not helped the focus of my collection, rather the reverse, leading me down all sorts of divergent pencil pathways. Still, I guess that’s part of the fun. Blogs are inherently designed to be read from the most recent entry to the oldest. If you reversed that and read this blog from the first post to the most recent I think you would see the standard of my reviews improve, my aversion to rubber grips decline and my pencil-photography skills improve. There would also be my battles with PAS (Pencil Acquisition Syndrome), NID (Notebook Inferiority Disorder), boozy-sirens and sundry other problems that folk have to watch out for. Of course you would also see me learn lots of things about mechanical pencils and the companies that manufacture and sell them. Besides all of that, one of the main things I like about this blog is the interaction with you, the readers. I really do enjoy getting comments and emails from you. At the risk of offending some by omission, I must make mention of several long time fellow pencil bloggers who have communicated with and helped me for a large part of this blogs life, so, in alphabetical order – Lexikaliker, Pencil Talk, Pencils11 and The Uncomfortable Chair. Also of course the aforementioned and recently resurrected Pencil Revolution. Thanks guys. There are of course many other bloggers and correspondents I should mention, but there are too many of you to mention individually, especially Henrik, so I hope you won’t be offended. Thanks to you all. Perhaps above all though, I have been very pleasantly surprised at the generosity of so many of you out there. People who I have never otherwise met or corresponded with, just contacting me and saying, “Hey, I’ve got a couple of pencils I thought you might like. I’ll send them to you”. I really do appreciate your generosity, and I have tried to keep the cycle going, although I’m sure I’ve ended up receiving more than I have given. Right then, some numbers would seem to be appropriate, just for posterity. When I was writing this post about a week ago, this blog contained 476 posts with 6,206 comments. Which is my favourite post? Well that’s a tough one, but certainly one of the first that always springs to mind when I think of that sort of thing is The Pencils Of Vice. I guess though blog readers have a different favourite, because the article that has enticed the most people to actually take the time to comment on it is my review of the classic Pentel Sharp Kerry with 127 comments. Of course there are “lies, damn lies and statistics” and that’s certainly the case with trying to measure anything to do with blogs and websites. I employ numerous reporting packages, and the differences between them is frequently mind boggling, but taking a bit of a statistical average, I can give some ballpark figures. Over the course of this blog there have been about 900,000 visitors who have generated about 2.6 million pageviews, but these days I get about thirty thousand visitors and one hundred thousand pageviews per month. Strange but true, there appears to be a mechanical pencil season, a specific month when the stars, moons, planets, biorhythms and all that stuff align such that mechanical pencil madness breaks out on the internet. The month of MP Madness is October. October 2007, 2008, 2009 and 2010 each set a new all-time record for the most visitors per month! The most frequently viewed article on this blog is “Lead Size and Hardness”. It’s then a long way back to second where my reviews of the Pentel Sharp P205 and the Pentel Sharp Kerry continually battle with each other for the silver and bronze medals. For the static pages of ‘My Top 5’, ‘Top 10 General’ and ‘Top 10 Drafting’, the most frequently viewed is ‘My Top 5’ with ‘Top 10 General’ a fair way back in second. As for regular readers, well the blog currently has 201 public Blogger Followers, there are about 850 feed subscribers, and 489 people voted on my reader survey although that was way back in March 2010. Not surprisingly most visitors are from the Anglosphere, with the USA accounting for about 56% of all visits, followed by, in order, the UK (9%), Canada (6%), Australia (3%), Germany (2%), Japan (2%), and then Turkey, Brazil, Italy, Singapore, Spain, Taiwan and India all at around 1% each. My Flag Counter has 194 flags, thus recording visitors from 194 different countries/territories around the world. The last flag added was that of Rwanda. ClustrMap makes it clear where the home of mechanical pencildom is…at least as measured by visits to this blog. A big Hello then to Los Angeles, you MP nuts! Your northerly cousins up there in San Francisco follow closely behind, then London and New York. Actually, as a source of American visitors, the state of California is so far ahead, that the next two US states added together (New York and Texas) still don’t get near California. Well, that seems like enough contemplation and other carry on, so I wish you all well, thanks for reading this blog, please carry on reading and commenting, and maybe I’ll see you in another five. Now, as you know I’ve never really been one for giveaways, but as part of these birthday celebrations there will be a series of giveaways throughout the month of February. The giveaways are mostly items from my collection, but will culminate in what I think is a real whiz-banger, thanks to some generous sponsorship from Cult Pens. That’s the reason for the new headline and sidebar references to Cult Pens. Quid pro quo. So, if you are doing a little writing instrument shopping then I would encourage you to check out their website, and spend your money with them. As a bonus, they are actually nice folk too. Anyway, the first giveaway kicks-off shortly and I hope you will all enter. You gotta be in to win. So, in closing then, happy pencilling my friends! May your lead stay strong and unbroken. Only the severity and duration of the celebratory hangover are in question. PS - Just so you know, the month of February will be mostly giveaways, there won't be much in the way of normal postings. For general writing mechanical pencils, I guess that effortless automatic lead advance, which the user is unaware of, is one of major goals for the designers. I’m not sure they will actually reach that goal with the current types of auto advance mechanisms as they are activated by physical contact with the writing surface, and thus the alert writer will always be aware of something going on. For perfect automatic lead advance I think we will have to wait for some sort of proximity sensor that knows the tip of the lead sleeve is getting too close to the paper and that it is therefore time to advance some lead. I feel I should know better, but automatics do have a certain allure to them, and so yet again I found one in my hand. Will this tale of the automatic be the familiar one – long on promise, short on delivery? With pencils like the Super Promecha, Ohto are known for marketing some of the most advanced, customisable, technical, complicated, gimmicky (take your pick) mechanical pencils around. Surely an automatic from them is likely to be better than most? So then, the Ohto Auto Sharp AP-205 mechanical pencil. It’s a lightweight mostly plastic pencil. The styling and colour scheme are quite nice, although nothing outstanding. The body and the grip are triangular, although the front end of the grip does start to taper down and transition into round where the front tip screws in. The triangular grip is made from a smooth rubber compound which is quite hard, with a relatively smooth surface. The rubber does improve the grip properties a small amount, but not by much. The grip is an average size so should suit most who like an average sized pencil. Now, as we know, the Ohto Auto Sharp has an auto-advance lead mechanism. Firstly though it is also a standard push top ratchet mechanism pencil. Ten clicks on the top button will get you a whopping great 14mm of the 0.5mm lead. 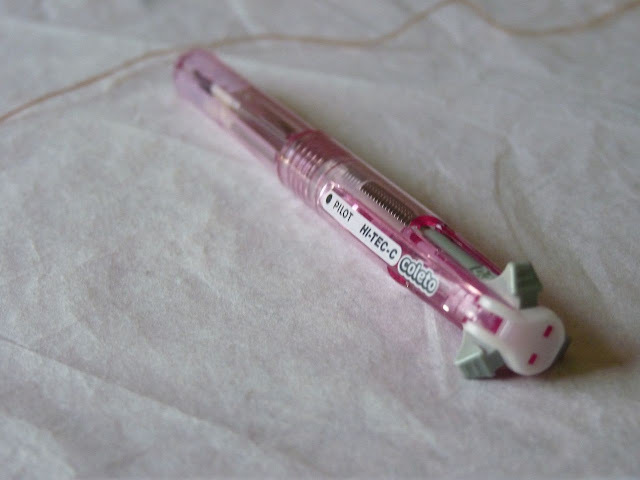 The lead sleeve is a short plastic cone which is retractable so this is a pocket safe pencil. Right then, how does this pencil perform when you don’t click the top button and let the auto-advance mechanism take over? Well, basically it performs as expected. It advances lead when the tip hits the paper and when that happens you can notice some small differences in the feel and lead application to the paper. For me personally the major issue I have with many auto-advancing mechanisms is ‘plunging’. That’s my name for the phenomenon of suddenly, whilst you are happily writing away, the whole lead sleeve retracts back up into the front tip and you ‘plunge’ forward. It’s really annoying and disconcerting. It sees to affect some pencils far worse than other…although for all I know they all possibly have the same design mechanism. Well, the Ohto Auto Sharp is one of the better performer in this aspect – whilst I did experience some plunging, it was relatively rare and not too dramatic. So, basically as always, I’d suggest you use the pencil in the normal manner, advancing the lead manually and just letting the auto-advance take over for those infrequent occasions when you are ‘caught short’, as it were. Hmmm, just thinking about the auto-advance mechanism for a bit longer. It works by having the plastic lead sleeve make contact with, and thus rub on, the paper. I assume the plastic sleeve is made from a decent engineering plastic like acetal or something, but paper is just really compressed wood fibre and any woodworker knows that saws and all their other fine steel tools go blunt when in contact with wood. Really, despite what is feels like, paper is actually reasonably tough and abrasive. Cutting paper with a steel knife will dull the blade over time. So, how about that plastic tip then? Actually, I didn’t even need my magnifying glass. After two weeks of use, I could see the edge of the lead sleeve cone had been worn away. Viewing with a magnifying glass just confirmed it. The triangular grip on the Ohto Auto Sharp must actually increase the wear because the pencil can only held at three specific rotations, and because of the pocket clip, many users, like myself, will not even rotate it at all and thus the exact same spot on the lead sleeve will always be making contact with the paper and thus be worn down even quicker. Obviously paper type, amount of hand pressure, amount of use of the auto-advance feature and amount of rotation will all affect the rate of wear on the lead sleeve. Who knows how long it would take before the cone wears down so much as to affect the operation of the auto advance? I imagine though it would be a fairly long time, and most users would have misplaced their pencil before it happened. Still, it’s an interesting little thought process. Carrying on then, as expected there is a small eraser under the push top button, and you remove that to access the lead refill magazine. The pocket clip is moulded plastic and actually quite stylish and functional. Markings on the body are “Ohto” printed on the pocket clip, and “Auto Sharp 0.5mm AP-205” on the body. I fail to find the word “Japan” anywhere on the pencil. I imagine that implies something. So, in closing then, the Ohto Auto Sharp is a nice enough mechanical pencil for its price range, but as usual I am left a little nonplussed with the auto-advance mechanism. Must try harder to resist the allure of the automatic…but hey, down this way the general public can’t own handguns…so temptation abounds…automatic pistol…automatic pencil? • Best Points – The auto-advance works reasonably well. • Not So Good Points – Considering what this pencil is, and its price range, then nothing much. • Price Range – Low. • Does this pencil make it into the Top 5? - No. Dimensions – Length 141mm, width 11 mm across the face of the body. Balance point about 65mm up from the tip. This Ohto Auto Sharp AP-205 mechanical pencil was sent to me gratis by Cult Pens. Thanks Cult Pens. When I first started this blog I thought it would be of interest to a few people from the mechanical pencil using groups like engineers, architects, designers, artists, writers, etc. This has largely turned out to be true, but there is one group of readers that I did not anticipate, and it’s rather silly of me to have not anticipated some interest from them, especially because my mother is one of them. The group I am referring to is the one I have come to call “The Crafty Ladies” with a subset of “The Ladies Who Sew”. Mechanical pencils and multi-pens find favour with many who scrapbook, make cards, sew and embroider, etc. The search for the ultimate multi-pen is not taken lightly, and the quest for the perfect white lead is a True Quest. White lead? Yes. Over the course of this blog I have had quite a few contacts from ladies trying to find the ultimate in white lead for material marking. For many, the traditional soap and chalk markers just don’t cut the mustard. 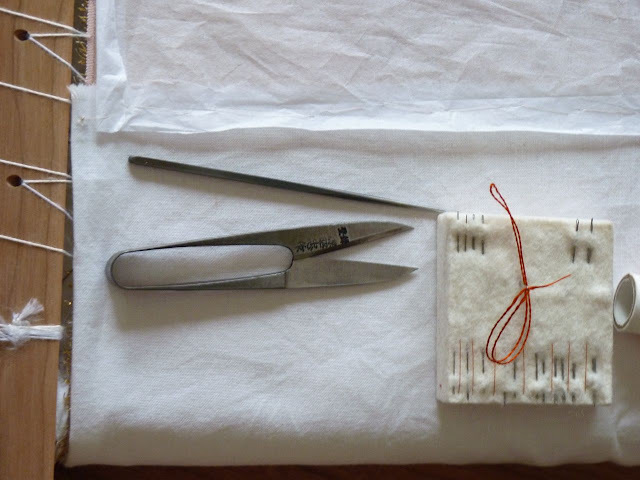 Strong enough to not break when marking woven fabrics. Thin enough to be accurate. Preferably temporary in that it can be washed off. Definitely non-running or bleed through. These are just some of the desired attributes of the mechanical pencil white lead. I am afraid I haven’t been able to offer much help. Sakura have some white leads, but they generally seem to be 0.9mm. The white lead for the Striker mechanical carpenters pencil has some possible uses but requires sharpening. Pergamano offer a 0.5mm lead which many seem to use. These and the others though all seem hard to obtain and not entirely satisfactory. Recently I was contacted by Christine who was looking for some multi-pen and lead assistance for her embroidery hobby. I suggested she might like to do a little blog article about her use of pencils, and she agreed. So, without further todo, I will now hand over to her. I some times need to mark on the fabric, for example to note the direction of stitches. 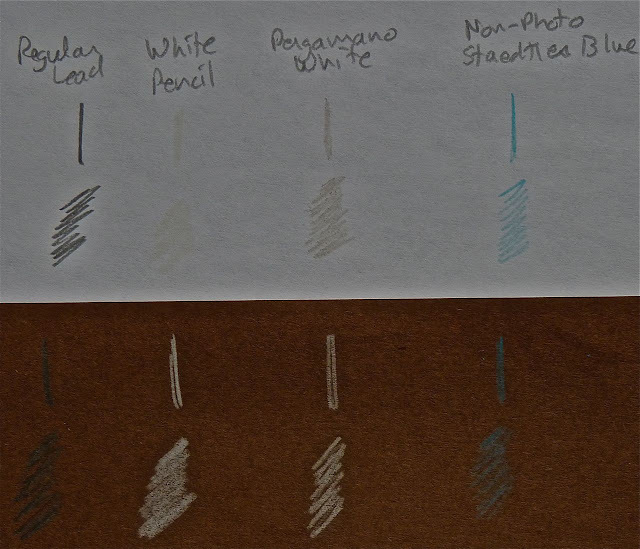 Depending on the color of the fabric, we use either a white or non-photo blue 0.5 mm pencil lead - whichever will show up better. 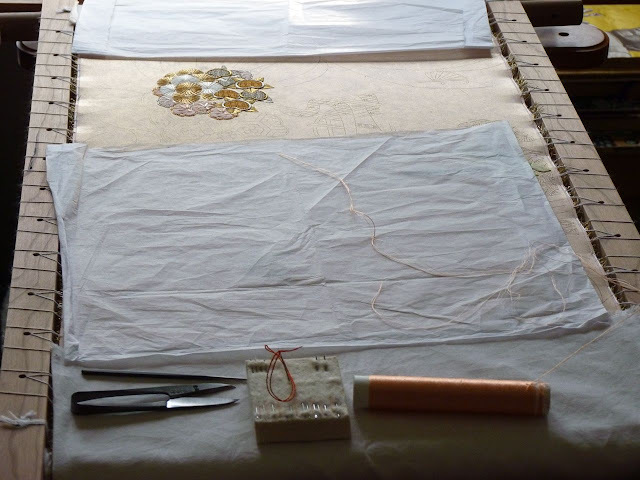 The blue lead is one which has been tested by the professionals at the Japanese Embroidery Center, and its color will not run during the finishing process, when we apply a wheat starch to the back of the piece and steam it thoroughly. My teacher gave us several leads, it is a Staedtler Mars product per the printing on the container. Historically, the white lead is a Prismacolor Verithin pencil, which can be sharpened to a fine point. 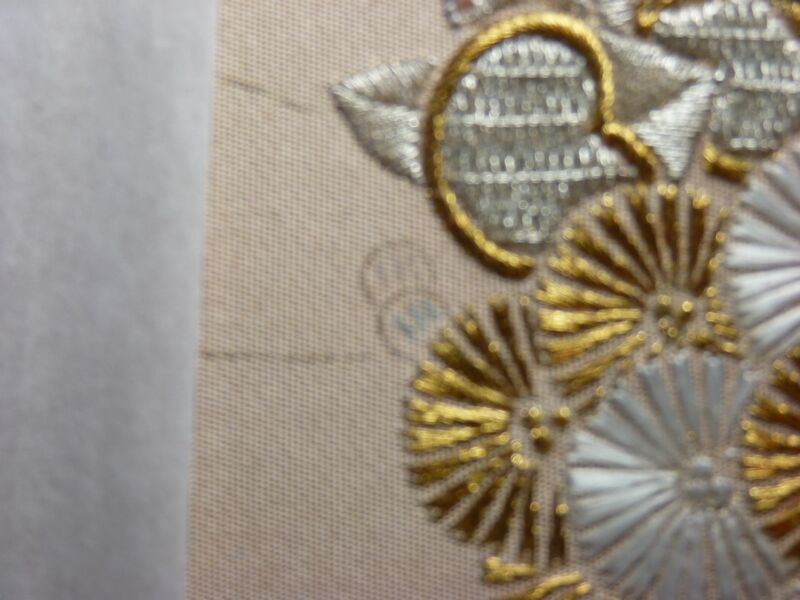 For us, the finer the point, the better, as we may stitch with silk threads as thin as 0.1 mm. Recently, I have discovered a 0.5 mm white lead from Pergamano, which provides the fine point we like. I find the Pergamano color to be shiny, sometimes appearing silver/grey, and the lead is soft. The Pergamano white lead is designed for a card-making process called Pergamano, and I’ve only found it via one supplier. In this photo, I’ve drawn on white and brown paper with 4 leads - 0.5 mm regular lead, Verithin white lead, Pergamano 0.5 mm white lead, and 0.5 mm Non Photo blue lead. My other multi pen is for travel use, and is a Uni-ball Style Fit 5 Color Gel Ink Multi Pen Pen Body, containing 2 pen cartridges and 3x0.5mm Mechanical Pencil Components. Both of these multi pens are super for my needs. I wish I needed more lead colors so I could have more of these multi pen/pencils. They have turned me in to a pencil geek. If you’re interested you’re welcome to view my facebook albums (you don’t need to be on facebook to view them) here and here. 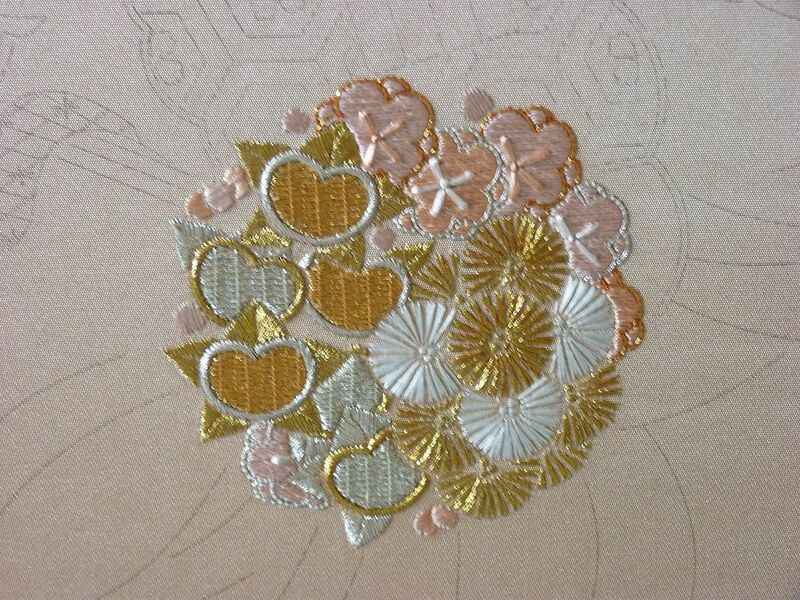 More information is at http://www.japaneseembroidery.com/. Christine, Washington DC area, USA. Great stuff. Thanks Christine. The hours of work in those Facebook embroideries…. From The Desk hmmmm, Courtyard Deckchair. Happy New Year folks. Well I'm back from holiday, melting in the heat. However, whilst I've been away several of you 'up over' northerly folk have sent me pictures and/or stories of yourselves buried beneath mountains of snow and ice so I do spare a thought for you. Also of course my friends and rellies across the ditch in Aussie sitting unhappily in the middle of their muddy lake the size of Germany and France put together. But this is a pencil blog, so we must move onto pencilicious matters. This Christmas I purchased a little pencil present for myself. A book, which I'm slowly working my way through, from the chair, as it were. Published 2010, my copy is one of the Limited Edition copies, signed by the author, with gold stamped cover box. Hmmmm, number 93 of 100....I'm kind of worried that might mean I'm the 93rd biggest Conway Stewart nerd in the world? I don't even collect FP's!!! It's a history of the company just as much as, perhaps even more than, a history of their writing instruments. Some interesting stories like the difficulties of manufacturing during the wartime. From the amount of vintage Conway Stewarts available locally I've always assumed the Antipodes were an important market for CS and the book confirms this. Chapter 1939-1948, "Conway Stewart were particularly strong in Australia, New Zealand and South Africa" and "By 1948 60% of Conway Stewart's output went overseas with Australia, New Zealand and South Africa still the major markets". Chapter 1955-1962, "New Zealand, despite the size of its population (with sheep outnumbering them 100 to one!) was also an important market". Of course most of the pictures are of inky things, but graphite and mechanical pencils gets it fair share. Also lots of data like tables of model numbers, copies of old patents, etc. Clearly a must have for anyone with an interest in Conway Stewart. The book is available as detailed here. A special thanks to Leigh Reyes (she's a verb not a noun) for alerting me to this book by mentioning it on her blog. Normal blog transmission will resume in a week or two.